HOUSTON, TX -- The Port of Houston is one of the busiest ports in the U.S., and it is expected to get even busier by 2018. However, the growing congestion along the port could that could lead to greater opportunities for the Port of Freeport. Since 2011, leaders at the Port of Houston have been looking forward to the opportunities that would come with the widening of the Panama Canal, but the growth of the petrochemical industry, and the increase in trade has fostered an unforeseen and rapid growth that has manifest in greater traffic congestion. The Houston Business Journal reported that in 2010, 10,000 trucks per day used the road system near the port. Five years later, the number of trucks more than doubled to about 25,000 to 30,000 each day on the same unimproved thoroughfares. With more projects and greater population growth projected along the port,the traffic counts expected to double again by 2018. Meanwhile, other routes and other ports in Texas could be considered as alternatives in the very near future, and one of those is being led by a group called the Highway 36A Coalition. Fort Bend County Commissioner Andy Meyers, who serves as the chairman of the 36A Coalition, other members of the 36A Coalition, and Port Freeport, testified before the Senate Select Committee on Texas Ports on May 4 and presented the case that the port is best poised of any in Texas to benefit from the Panama Canal Expansion, thereby establishing the viability for the 36A corridor. Since 2007, efforts have been underway to create a new route from the Port of Freeport at Texas 36, into Rosenberg, and build an alternate --36A-- from Rosenberg, and continue north through Waller County to connect with Texas 6, providing traffic routes that bypass Houston to the west. beginning to be funded and likely to start construction as early as 2018. One of those roadblocks is the Katy Prairie Conservancy. The 501(c)(3) organization, which is dedicated to preservation of land and native species in the region, is hoping the proposed route can be re-directed farther west. Another potential roadblock is, or has been, funding. However, that could change depending on the outcome of an environmental impact study. Earlier this year, the Highway 36A Coalition was awarded $2 million from the Texas Department of Transportation to conduct a 15-18 month engineering study on the potential environmental and economic impact of the road. In the next 10 years, more than 600,000 people are expected to live along the corridor in Waller, Fort Bend and Brazoria counties, most of those in Fort Bend County. And at the current rate, the Houston region could see as many as 4 million new residents by 2040. As a result, the population in Waller County alone would swell to about 200,000 residents. That rapid growth, however, has worried Piacentini, supporters of the Katy Prairie and opponents to unfettered growth in rural areas around Houston, who are concerned that the loss of prairie habitat will affect the region. FREEPORT, TX (SEPTEMBER 22, 2016) – The Port celebrated the first Neo-Panamax vessel to call Port Freeport. The Motor Vessel Hoegh Target was successfully piloted into Port Freeport on the evening of September 14. Executive Director/CEO Phyllis Saathoff and Port Freeport Commission Chairman Ravi Singhania boarded the Hoegh Target with the pilots on its journey into the Port. 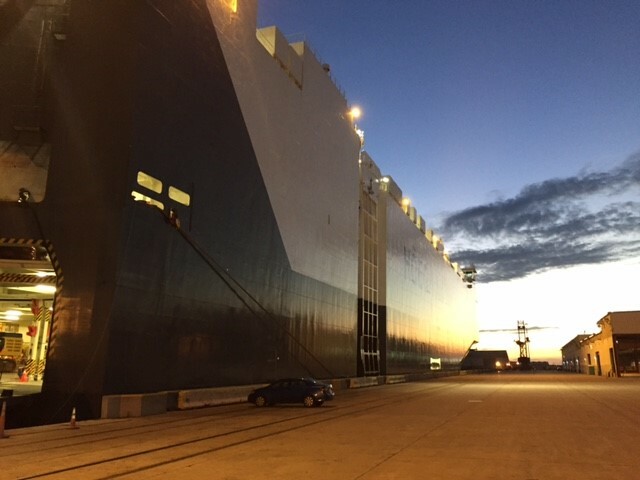 Hoegh and their Terminal Operating Division, Horizon Terminal Services came to Port Freeport in 2015, establishing a state of the art facility that exports Texas built General Motors automobiles and the import of both Buick and Chevrolet vehicles manufactured in Korea. 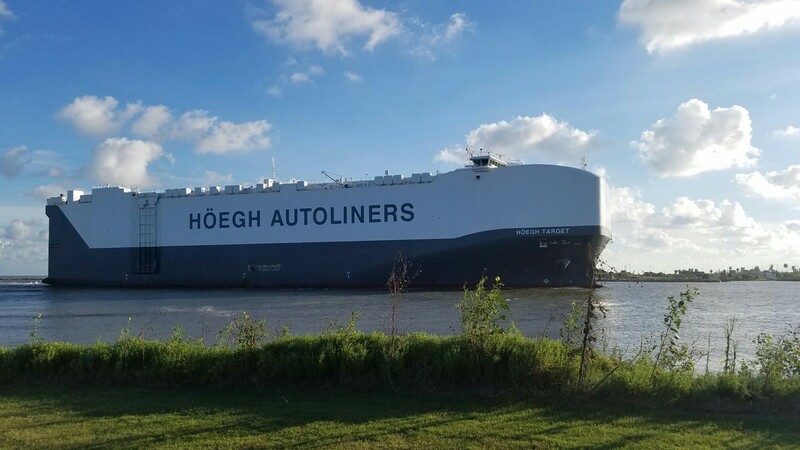 Hoegh has created numerous jobs for residents of Brazoria County. Realizing that Hoegh would soon be our long-term partner in both the growth of their business and the expansion of Port Freeport, we rapidly began improvements to our terminal facilities. “We converted over  acres into an Original Equipment Manufacture terminal with over 6,500 vehicle parking spots. Over 100,000 square feet of Port Freeport’s warehousing capacity has been converted into a first-class vehicle processing center,” stated Chairman Singhania. Port Freeport is ranked among the Nation’s top 35 ports. The Channel serves Dow Chemical, Phillips 66, BASF, Tenaris, Vulcan Material, Mammoet, Freeport Liquefied Natural Gas, American Rice, Dole, Chiquita, Seaway, Mediterranean Shipping Company (MSC) and Hoegh Autoliners. ANGLETON — County commissioners approved tax breaks for a pair of projects expected to generate nearly $2 billion for the county. Commissioners green-lighted a 10-year, 100-percent property tax abatement for a proposed fourth processing unit — called a train — added to Freeport LNG’s liquefaction project at its Quintana terminal. At the same meeting Tuesday, commissioners approved a seven-year, 100-percent property tax abatement to Praxair Inc. for an argon, oxygen, nitrogen and carbon dioxide manufacturing facility it is considering building in Brazoria County. Precinct 3 Commissioner Stacy Adams was the lone dissenting vote both times, saying he cannot support 100 percent abatements. “I’m not against abatements, I just don’t want 10-year, 100 percent,” Adams said. “I could have supported five years and once they’re producing, we should have had a graduated scale. The remaining commissioners supported Freeport LNG’s venture, which will bring $1.75 billion to the county, as well as Praxair’s, which could generate more than $100 million if Brazoria County is chosen, according to the tax abatement. Freeport LNG filed last year for another permit with the Federal Energy Regulatory Commission after executives determined a need for a fourth train, Commercial Director Lance Goodwin said. Freeport LNG expects to formally file its permit request with the commission by the end of this year, receiving the permits by the end of next year. “The train will be identical to 1, 2 and 3,” Goodwin said of the unit, which will convert natural gas into a liquid to be piped into ships when it starts operations in 2021. The four-year construction period of the fourth train will bring more than 1,000 on-site engineering and construction jobs and 53 full-time employees, in addition to the 4,000 construction jobs and $12.5 billion the project already promises, Goodwin said. The company originally built its Quintana terminal to receive liquefied natural gas by ship from overseas. However, the drop in price of domestic natural gas made importing the fuel less necessary, prompting the company to retool as an export facility. The first train will start operation in September 2018. The second train should follow suit five months later, and the third train comes online six months after that. Praxair also is considering Harris and Galveston counties for its $104 million facility, as well as various sites in Louisiana, according to the tax abatement application. The project would bring 15 permanent jobs to Brazoria County, as well as 50 to 70 jobs at the peak of construction. Erinn Callahan is a reporter for The Facts. Contact her at 979-237-0150. F REEPORT, TX (August 10, 2016) – Port Freeport delegation participates in Panama trade mission. The Port was well represented at the recently-concluded Texas Trade Mission to Panama, led by Texas Lt. Governor Dan Patrick and Senator Brandon Creighton, Chair of the Senate Select Committee on Ports. 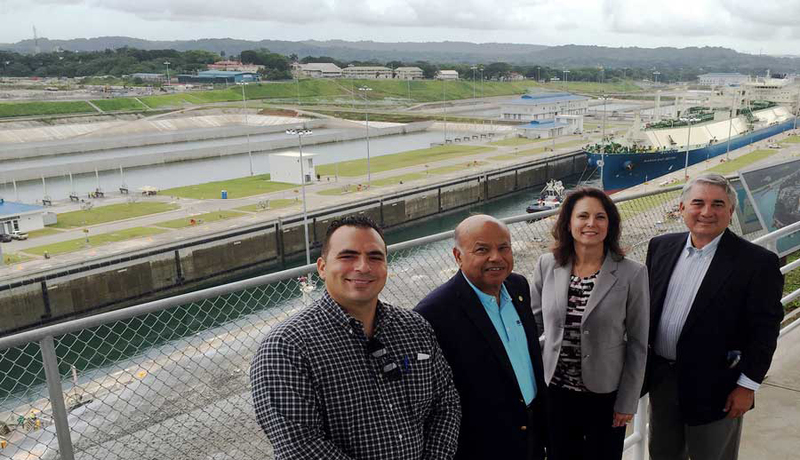 Commission Chairman Ravi Singhania, Commissioner John Hoss, CEO Phyllis Saathoff and Business and Economic Development Director Jason Miura joined in meetings and tours with private sector and Panamanian Government officials and observed the expanded Panama Canal in operation. CEO Saathoff presented Trade Mission attendees with a report on Port Freeport, highlighting its successes to date and focusing on the future, where “Port Freeport looks forward to the new opportunities that the Panama Canal Expansion is bringing to both our Port and the entire State of Texas. Port Freeport is ranked among the Nation’s top 35 ports. The Channel serves Dow Chemical, Phillips 66, BASF, Tenaris, Vulcan Material, Mammoet, Freeport Liquefield Natural Gas, American Rice, Dole, Chiquita, Seaway, Mediterranean Shipping Company (MSC) and Hoegh Autoliners. 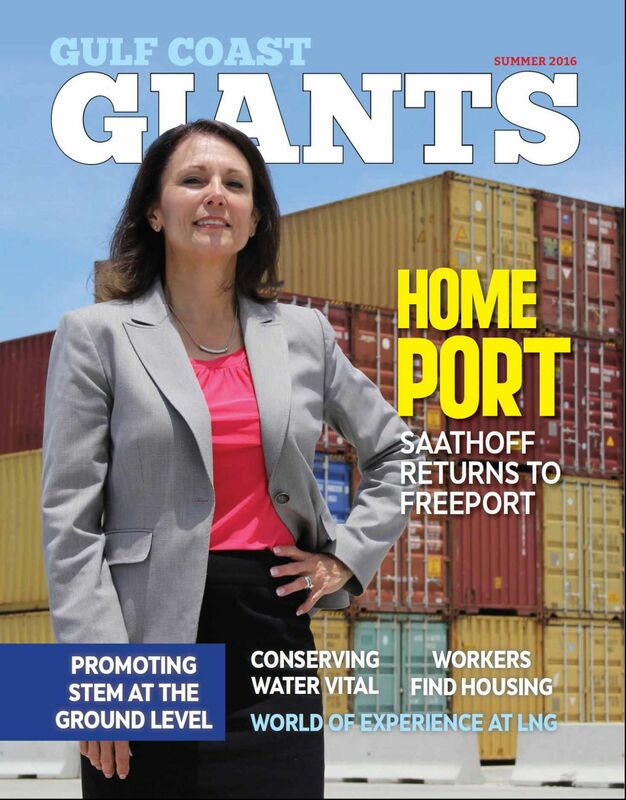 In this edition, Phyllis Saathoff, the Port's newly appointed Executive Director, speaks about the deepening of Port Freeport and the expansion of the Panama Canal. 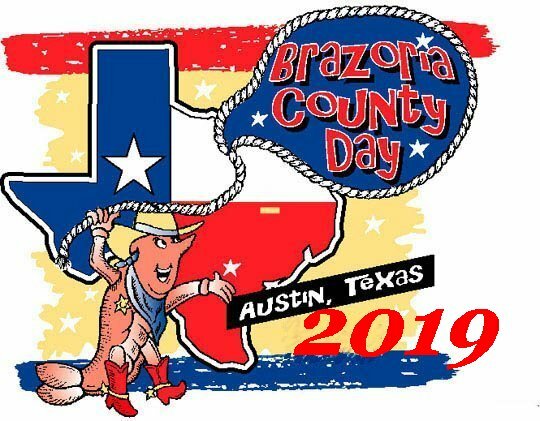 Plus, learn about the Zip Code Study that we conducted in our office detailing where the growing workforce in Brazoria County in choosing to live.